Hyatt Regency Bloomington – Minneapolis Review: Modern & Comfortable But What’s With the Bathtub? The Hyatt Regency Bloomington – Minneapolis opened about a year ago and is part airport hotel, part business hotel and part tourist hotel given its location close to several office buildings, MSP airport and the Mall of America. The new property features 303 guestrooms and has a fairly modern look and feel. Following our time in Mexico at the Hyatt Ziva Cancun and Andaz Mayakoba properties, I decided it might be nice to take our daughter to Mall of America. Actually, I found a great fare on Delta with an overnight in MSP and decided why not? We saved some money, she got to ride some rides and then we eventually made our way home to Las Vegas. Not the most direct route, but an adventure nonetheless. I used an expiring free night certificate for the room, but here are the alternate ways I could have paid. Since the Mall of America and MSP Airport are so close to each other, this hotel is convenient to both. The hotel has shuttles that run to both the airport (10 minute drive) and Mall of America (5 minute drive) twice per hour during the day and the light rail line to the airport and city is just outside of the entrance. While we utilized the shuttle to/from the Mall and back to the airport, our late arrival meant we had to take an Uber to the hotel. At a cost of about $10, it wasn’t bad at all. The map above shows the airport exit in the top right, the Mall of America in the bottom left and an empty field (red arrow towards the bottom) where the hotel is located. The hotel is so new it doesn’t show up on Google Maps satellite. Note that Downtown Minneapolis is about 20 minutes away by car. The Hyatt Regency Bloomington – Minneapolis has a very modern lobby. Once inside the small check-in desk is located to the left, while ample seating including a cozy couch and fireplace are off to the right. Further down on the right is more seating, a bar and the hotel’s restaurant which several people told me is very very good. Since we arrived to the hotel late, check-in was quick and painless. We were given a room with 2 queens as requested and told about the hours for the Regency Club (a benefit of my Globalist status). Despite being told the club was closed, I was happy to see it open late so I could grab some waters before bed. I also requested a 5pm checkout instead of the normal 4pm checkout given to Globalists and they generously gave it to me without hesitation. The Hyatt Regency Bloomington – Minneapolis isn’t going to win any awards for their fairly typical rooms. As mentioned before, the decor is attractive and modern which I liked, but the room didn’t have anything special either. This is a Hyatt Regency though, so to be fair I wasn’t expecting anything special either. Besides two beds and a small table, the room featured a 55″ television. (More photos at the end.) All of this was fine, but the bathroom was a bit of a letdown. While I did enjoy the wood paneling over the vanity, for some reason this brand new hotel decided to install 80’s style tubs with shower curtains instead of a nice standalone shower. I simply don’t get this, but of course it isn’t a deal breaker just a curious design choice. As I mentioned, I was able to grab some beverages from the lounge in the evening, but we arrived too late for the evening service. We did however enjoy breakfast in the lounge. It was a fairly basic and sparse spread with fruit, pastries, bacon, sausage and eggs. This was all fairly basic, but their waffle maker saved the day. Sure waffles are something even motels often have, but the batter they were using was DELICIOUS! Hyatt Regency Bloomington – Minneapolis Club Lounge breakfast. The Club Lounge itself is very small, although we only saw a total of four other people using it when we were there. Normally a lounge will only have one attendant, but this hotel had two people on duty. This meant at times the employee to guest ratio was about even. They provided great service! In addition to Urbana Craeft Kitchen which is the hotel’s well reviewed restaurant, the property has almost 12,000 square feet of meeting space. 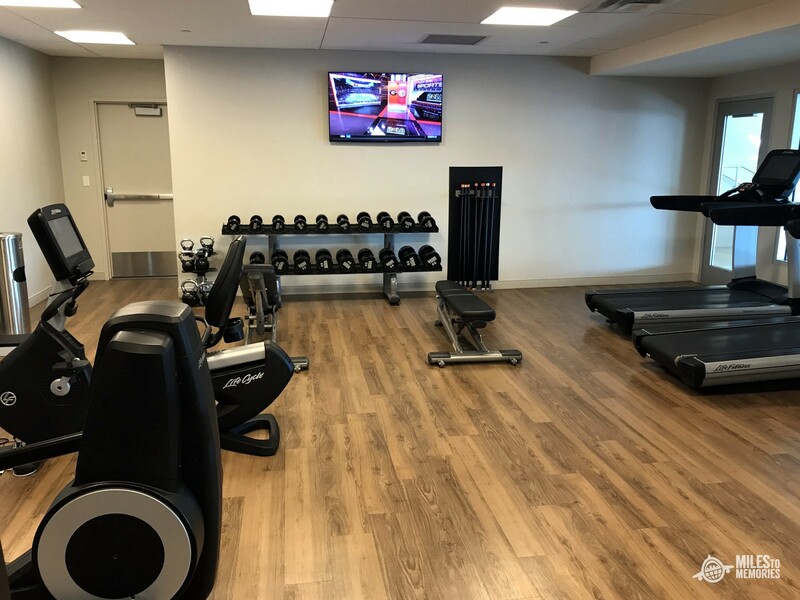 For those who want to relax a bit while staying there you’ll be happy to know the Hyatt Regency Bloomington – Minneapolis has a nice indoor pool and a full equipped gym as well. If you are looking for a modern hotel (bathroom aside) in a location close to the airport and/or Mall of America I think the Hyatt Regency Bloomington – Minneapolis is a great choice. While there isn’t anything that will blow you away about this hotel, its location is good, the staff is friendly and the rooms are modern and comfortable. In the end could you ask for anything more? A beautiful modern hotel in a great location close to both Mall of America and the airport. Next articleGet a $15 Bonus with Purchase of $150 Best Buy e-Gift Card! Thanks for the review. I’m staying there tonight in fact. They have been very good with Globalist recognition…especially if you have stayed there once before. I usually always get upgraded to their large suite without asking. Even as a Globalist, I prefer the $83 +3,000 points rate that is often available. Lots of hotels will have a standalone shower in rooms with a King bed, but go to the tub for 2 beds. I am guessing to utilize if parents have small kids. It seems to me that the newly built hotels seem to have a tub in the rooms with two queen beds and a shower in the king rooms. Did you ask if that was this hotel’s design choice? Can always use a tub as a shower… not really the other way around! Some people, a lot, prefer showers! What’s strange about that? Brian is correct. I’ve stayed at this property in a King bed and had a nice glass surround shower. I’m guess the put tubs in the queens since more likely to have that need baths. Local hotel for me and I experienced this property for the first time a few months ago. My one large complaint is the loading/unloading area outside the hotel. It had snowed overnight when I was there and while I went to retrieve my car, there was a family loading/unloading a car pretty much right outside the front doors. The very narrow sidewalk was full of this family’s belongings (not just luggage) and their car took up so much room that I had to got out and around both of these. While that wouldn’t have been the end of the world, as I walked around I was greeted with an avalanche of snow upon my head and down my neck. While I was neither impressed or disappointed in this typical Hyatt Regency, this moved my whole experience into the negative. For the life of me, I am not sure why the sidewalk is only a mere few feet wide and one would have to go way out into the drop off lane if anyone is blocking and parked by the one and only sidewalk to the parking lot off to that side. Also for the roof design to effectively dump snow on guests and presumably cars in a very snowy state is another design flaw in my eyes. Having stayed there last night I did find what you write about to be odd. They have a circle there for drop off, but it is very small. Maybe two cars at a time can fit there. Space constraint I guess.